If you're looking for a large SUV that does just about everything right, the 2013 Buick Enclave may be for you. It receives a complete facelift for the 2013 model year and several new features come along with it. Though the looks remain largely the same, the interior design and some mechanical changes have made the 2013 Buick Enclave a whole new animal. Buick is the General Motors brand that is supposed to walk the line between the blue-collar ruggedness of Chevrolet and the patented luxury of Cadillac. The 2013 Buick Enclave does an excellent job of being the flagship for that dictum. Its cavernous cabin and powerful style give it a decent edge over more expensive competition. The 2013 Buick Enclave comes in only one trim level but don't let that lead you to believe that options are limited. The one trim level of the Enclave comes with three upgrade groups. The first group is the Convenience Group, which brings automatic xenon headlights, rear privacy glass, heated mirrors, rear parking sensors, remote ignition, cruise control, tri-zone automatic climate control, rearview camera, a power liftgate, OnStar emergency assistance, an eight-way power driver's seat, and a Buick sound system with CD player, satellite radio and iPod/USB/aux interfaces. The Convenience Group doesn't stop there. It also includes Buick's new IntelliLink electronics interface. This new interface employs a customizable touchscreen, voice recognition, Bluetooth wireless connectivity, and smartphone apps to make for a nice driver control system. It goes well with the Leather Group, which adds a blind-spot warning system, a cross traffic alert system, leather upholstery with heated front seats, and an eight-way adjustable passenger seat. The Premium Group adds all the features of the Leather and Convenience groups, as well as power-folding side mirrors, auto-dimming rearview mirror, adaptive headlights, a power-adjustable steering wheel, heated and ventilated front seats, and a 10-speaker Bose sound system (which is an option for the Leather Group). A sunroof, rear entertainment system, Bose surround-sound system, and a navigation system are all optional on the Leather and Premium groups. There's wood trim and then there's Wow-look-at-all-that-wood trim; the 2013 Buick Enclave employs the latter of the two. The entire dashboard and center console are trimmed in enough wood trim to make a maple tree cry. At least, it's been dressed to look like wood; most of it is just dashboard veneer painted very pretty. Still, it does go a long way toward making the cabin of the Enclave one of the most regal in this class. Climate controls have been simplified with control coming from three straightforward knobs. They are all easily reached and simple to use. The large touchscreen is a nice feature that makes using the IntelliLink system much easier and the system itself is quite simple as well. Seating is comfortable if not a little stiff, but one area the Enclave is definitely not lacking is head- and legroom; both remain ample in all rows. If you're looking for roominess, then the Enclave is definitely your top choice among crossover SUVs. Not only does it boast some of the best seating available but it also has a cavernous maximum cargo capacity of 115 cubic feet. That is, of course, with both rear seats folded down; but even with both seats in place there is still 23 cubic feet of cargo capacity in the rear. That's at the top of the scale for this segment. 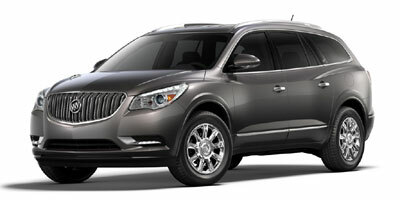 The 2013 Buick Enclave comes standard with a 3.6L V6 engine that's good for 288 horsepower and 270 ft.-lbs. of torque. It comes with a six-speed automatic transmission and front-wheel drive is standard; all-wheel drive is optional. The EPA estimates fuel efficiency for the front-wheel drive Enclave to be at 17/24 mpg (city/highway) and 16/22 mpg for the all-wheel version. The V6 produces enough power to have ample acceleration and never feels bogged down, but it will never be described as sporty. Overall, the 2013 Buick Enclave is simply pleasant to drive. It doesn't offer thrills or exhilaration. It's not something you'd take down to the local racetrack to show off to your buddies and rev hard at stop lights. It's a comfortable, capable cruiser. It offers a quiet cabin, dulling both road and wind noise quite well, and handles with a confidence that can be found in models half its size. Braking for the Enclave was only average, bringing the SUV to a complete stop from 60 mph in 126 feet. At times, the sport-ute can feel heavy, but it pales in comparison to some rivals like the Chevy Tahoe and Lexus RX Series. Driver's seat comfort is definitely something worth noting, especially with the leather upholstery. The heated seats can get warm in a big hurry is you're not careful though. The 2013 Buick Enclave earned the Top Safety Pick Award from the IIHS, getting perfect scores in every one of their crash tests. The NHTSA has not yet crash tested the Enclave, but they did give it four out of five stars in the rollover rating. Standard safety equipment includes antilock brakes, stability and traction control, front side airbags, side curtain airbags, and a rearview camera. The Leather and Premium groups include a blind-spot warning system and back-up warning system. There are currently no major safety recalls issued for the 2013 Buick Enclave. J.D. Power and Associates gave it an average score of 3 out of 5 in its Vehicle Dependability Study. It is covered by Buick's 4-year/50,000-mile manufacturer's bumper-to-bumper warranty and a 6-year/70,000-mile powertrain limited warranty. MSRP ranges from $38,445 to $47,625. Interested to see how the 2013 Buick Enclave ranks against similar cars in terms of key attributes? Here are the 2013 Buick Enclave rankings for MPG, horsepower, torque, leg room, head room, shoulder room, hip room and so forth.